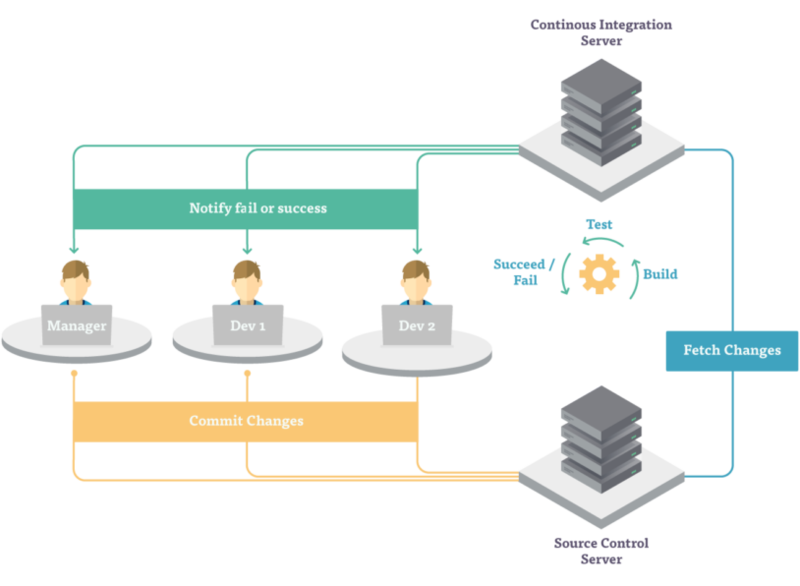 Defined in the simplest terms, Continuous Integration refers to a practice where developers integrate new code into a shared repository multiple times per day. This practice helps better manage the development process, especially when multiple developers are working on the same project. Traditional development methods don’t have a specific requirement to how often a project’s source code will be integrated. Developers can work on the same project separately for days or even weeks on the source code, and never realize just how many conflicts are being created. These processes often result in long debugging sessions which can severely delay deployment, or can lead to major software issues once deployed. The more developers that are sharing a code, the more problems that can arise in the long-term. Continuous integration exists to minimize these conflicts and to make it easier for teams to identify bugs and issues before deployment. During the agile development process, code must constantly be updated - but without an effective system in place, these constant changes can lead to infrequent commits and late testing. Continuous integration gives teams the ability to create a truly agile process while minimizing software errors and potential conflicts. Software companies often find that a continuous integration process is much more efficient for their businesses, but for a CI system to be effective, it must be implemented correctly. In the following post, we will explore everything you need to know about continuous integration and show you how CI can help streamline your businesses’ development processes. CI Explained: What is Continuous Integration? Continuous integration, or CI, is a development practice where code is integrated by developers into a shared repository several times per day. Each of these integrations can then be confirmed through automated builds and tests. Instead of making huge integrations every few days (or longer), small iterations are introduced frequently. Therefore, if a defect is detected, the specific change that caused it can be quickly identified. Development teams that don’t use continuous integration are more apt to run into integration challenges. Since their integration only happens occasionally, there is a high potential for error - one developer’s changes can easily conflict with another developer’s integrations. The longer it takes for an integration to happen, the more issues that are likely to appear - and the harder it will be to track down the source of these issues. In 1996, Steve McConnell presented a concept that Microsoft used for Windows NT 3.0 in the 1990s. This process was referred to as the “Daily Build and Smoke Test” technique and was mostly focused on frequency of integration as opposed to automation. In 1998, continuous integration officially became one of the core practices of Extreme Programming (XP) - an approach to software development that focuses on business results first and takes an incremental approach to product development with continual testing and revision. In 2000, Martin Fowler released an article that finally defined the “continuous integration” process. In 2001, the first “continuous integration server” was published under an open source license, with the name CruiseControl. Today, continuous integration and other continuous processes are used by some of the largest tech companies in the world. While establishing a great continuous integration process can be difficult for smaller development teams, the result of implementing one is often the same - quicker deployment with fewer errors. Implementing continuous integration comes with immense benefits for any organization. However, there are also several potential drawbacks that organizations should consider before deciding whether continuous integration is the right option for their particular project. Reduced risk - In most cases, the more people working a project, the riskier it is to integrate new code. When code is integrated infrequently and in large amounts, coding issues are probable. Debugging and solving these issues can be both expensive and time consuming; and could mean making extensive changes to the code. By integrating frequently and in small iterations, bugs can be pinpointed quickly and fixed without extensive debugging. Higher code quality - With less time spent on debugging the software, more time can be allocated towards building new functions and further developing the product. With each small change being automatically tested during integration, the CI practice leads to a higher quality of code throughout the entire project. Less stress on developers - The stress of debugging thousands of lines of code can be intense. Debugging sessions can be pressure-filled, as the organization’s administrators lean heavily on programmers to quickly fix customer-facing issues. Continuous integration eliminates a great deal of stress from the debugging stage, allowing developers to solve issues quicker, with less effort and with a shorter turnaround time. New team processes - Implementing continuous processes can seem intense to a team that is used to integrating with a different approach. Some team members may disagree that it is necessary, and not everyone may be convinced of the immense benefit that CI offers. Once a CI system has been implemented, team members need to be trained on all new processes to ensure that it is adopted by the entire development team. Associated costs - There may be some additional costs associated with establishing and maintaining an effective continuous integration system, and management may not understand why these costs are necessary. Over the long-term however, continuous processes tend to quickly pay for themselves as time and costs in debugging and solving issues is considerably reduced. Existing projects - Continuous integration is extremely valuable across any stage of a project, but it is much easier to establish a CI system when developing a new project. Existing projects may require a few more steps to set up effectively. However, with the right tools, a CI process can be set up rather simply; even with existing projects. What Does The Continuous Implementation Process Look Like? First, developer writes new code and pushes it to a central repository. The repository is monitored by the CI server and identifies changes when they occur. The server builds the system and runs automated tests. The development team is automatically informed if the test fails, allowing them to fix the issue immediately. This cycle is repeated continuously, integrating and testing throughout the entire project. A continuous integration (CI) tool is a software solution that helps you automate one more steps of the CI process - for example, it may run automated tests each time you push a new commit and report the results to a pull request. When combined with continuous delivery and deployment tools like DeployBot, developers can test their code on multiple configurations, run additional performance tests, and create an automated process for every step until production. Support: Depending on which solution you choose, support may or may not be included. If something goes wrong during the process of setup, integration or operation, it is important to know where you can turn for help. The duration between a query and a response from support could cause extensive delays in your project. It is also important that your solution has accessible documentation so that you can find answers to your specific issues, when necessary. Pricing Model: It is also important that you understand the pricing structure of whichever solution you choose. Some open-source software may be free in theory, but there may be associated fees for support or additional overhead costs that will be incurred over the long-term. On the other hand, paid solutions may have a fixed cost - but are often more inclusive in their features and offer more accessible customer service. However, different paid solutions often have different pricing models. Find a solution and package that suits the requirements of your organization, and be sure that you understand what associated costs may be required in the future. Integration: When choosing a CI solution, find one that easily integrates with your current tools. Being required to change all of your tools to support your new CI process can be extremely costly in both time and money. Many of the top CI solutions are designed to support a wide range of tools, or can be extended to support other tools through plugins; but some solutions are not as advanced and may not be compatible with your existing software. Product Features: Before choosing a solution, identify exactly what features are critical to your organization. Although some continuous integration tools are fully inclusive and provide a wide variety of different features, some specifically focus on only a few important features. A solution may provide a long list of features, but those features may not be the ones that are most important to your business; while another solution may provide the exact tools that you need, but not all the tools that you need. Evaluate which features your organization needs to create the perfect process and ensure that the software that you choose offers those features. User Friendliness: Implementing a new solution can be an intensive process, especially if you have a large development team. Each team member will be required to learn and adapt to the new process and the new software. Some solutions are highly advanced, making it difficult to set up and train your team to use them properly. The solution you choose should be easy to implement and simple for your team members to understand without an extreme learning curve. Continuous integration has many great benefits, but it is only one piece of the entire continuous development process. Continuous deployment goes a step further to introduce automated testing across several levels, and to automate the deployment of new code. 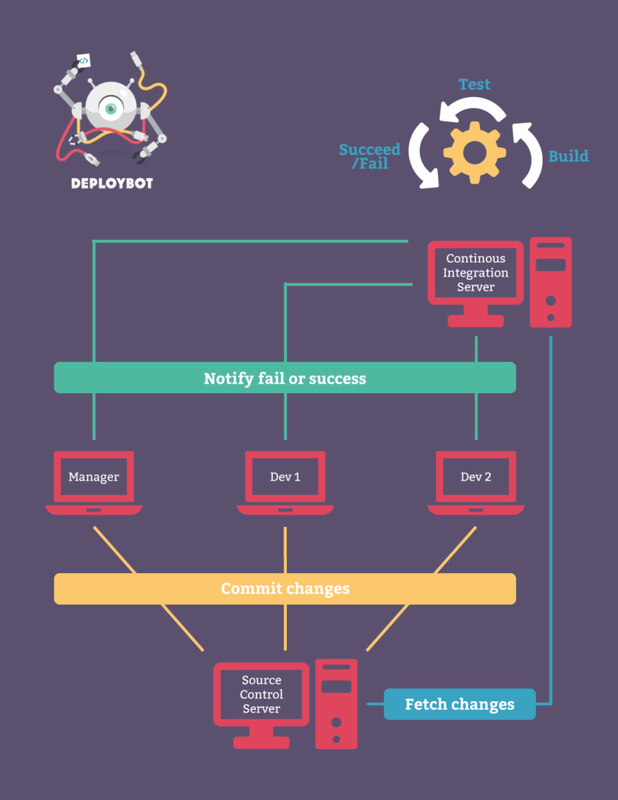 DeployBot streamlines deployment with a simple process - Push, Build and Deploy. While many continuous integration solutions exist, DeployBot offers a simple but highly effective solution that is extremely feature rich, but easy to implement and operate. With a scalable pricing model, DeployBot allows your organization to automate things that would otherwise take up a great deal of time - like server configurations, manually tracking changes and uploading files, and more. Additionally, DeployBot is compatible with a wide variety of different platforms. Check out our Code Deployment Guides to see how easy it is to connect DeployBot to your own project.